VIEW MY COMPLETE SITE HERE. 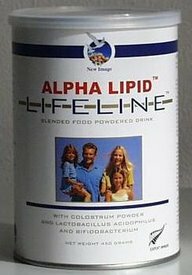 Our family has been taking Alpha Lipid Colostrum from New Image for 5 years now. We originally took it to boost our immunity. Of course that is a difficult thing to measure but we have not suffered any serious winter ills since starting on colostrum. With our busy lifestyles the increase in energy levels is a definite advantage. We see it as a valuable yet affordable preventative and nutritional supplement. One noticeable additional benefit is improved recovery after strenuous exercise. At nearly 54 the body is coping well with squash, golf, competitive masters volleyball and multiple daily dog walks. Regular domestic and international travel no longer causes any problems with adapting to time zones , foreign food and travel related illnesses. A longterm food sensitivity no longer causes uncomfortable gastric symptoms. Others we know have found relief from IBS, Crohns, Psoriasis, pre operative immune boosting and accelerated healing post surgery. We are hoping that the recognised anti aging benefits will become more apparent with the progressing years. Not all colostrums are created equal. There are many different colostrum products on the market, do your research. We chose the Alpha Lipid Colostrum for 2 main reasons. Firstly, Alpha Lipid colostrum is an exclusive formula from New Image that increases the dispersability and bioavailability of colostrum by up to 100%. Alpha Lipid also enhances brain and memory function. It has been associated with reducing symptoms of Alzheimers and depression and helps protect the liver and gut. 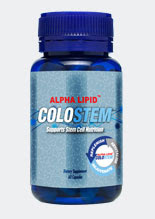 Secondly, Alpha Lipid Colostrum from New Image is made from 100% highest quality New Zealand colostrum, processed using specialised techniques that do not damage any of the active ingredients. 5 years ago we traded our Vitamin C, garlic and Echinacea tablets for Alpha Lipid Colostrum. We are still taking them daily and will continue to do so to benefit us as we age, actively, healthily and maybe gracefully! You owe it to yourself to try the best. You really have nothing to lose. Alpha Lipid Colostem: the second generation. Check out these stories from real people already enjoying the wonderful benefits of Alpha Lipid Colostrum and other New Image products. "Colostrum both in healthy subjects and high risk cardiovascular patients, is at least 3 times more effective than vaccination to prevent flu and is very cost effective. Some clinical studies have already shown that colostrum includes factors that are able to reduce chronic diarrhoea in immunodeficient subjects and improve symptoms of upper respiratory tract infection in adults. There is evidence that in some situations in which vaccination is contraindicated, the use of colostrum may be not only effective but the only practical alternative." For details on supply and prices to your part of the world : Email me. The information provided in this blog is for educational and informational purposes only. Visitors to this site are encouraged to make their own healthcare decisions based on research and, where appropriate, in conjunction with their health professional.